I supported the Walt Disney Parks and Resorts Online (WDPRO) team with prototyping, visual design and flash development for the new site. With every redesign our sites became more data driven and with more and more content for our users. 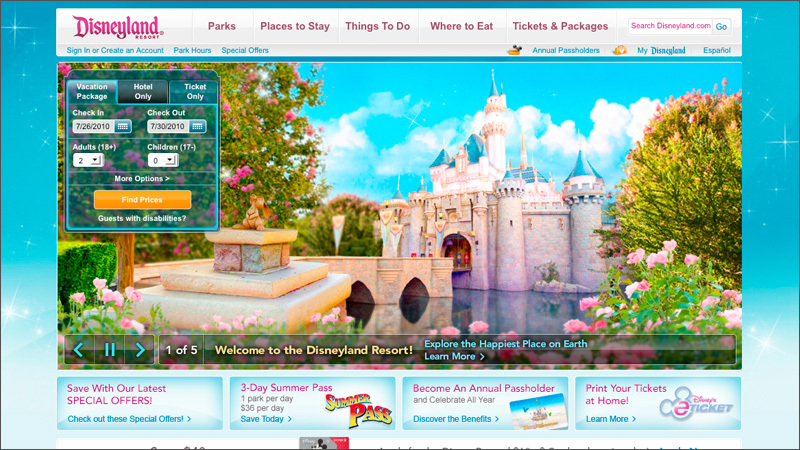 With the expansion of the Disneyland site we needed it to be lightweight and easily customizable. It great to see it come together with latest addition of our flash media player that boasts video, slides, 360s, interactive maps and section specific flash media. This redesign received great feedback and set the groundwork for the current media engine and present Disney.com site. Complete update the Disneyland.com site in the Nextgen style while developing interactive flash maps, applications and new branded media engine. The new site was essentially a complete, top-to-bottom redesign of the Disneyland content site. Leveraging the NextGen technology platform, the project operated on an aggressive budget and timeline by reusing code where possible, and innovating to deliver new tools and content relevant to the Disneyland audience. The team relied heavily on Guest insights to influence and validate the designs; input from site comments, Guest Communications teams, several qualitative research sessions and quantitative surveys enabled this 360-degree feedback design process.